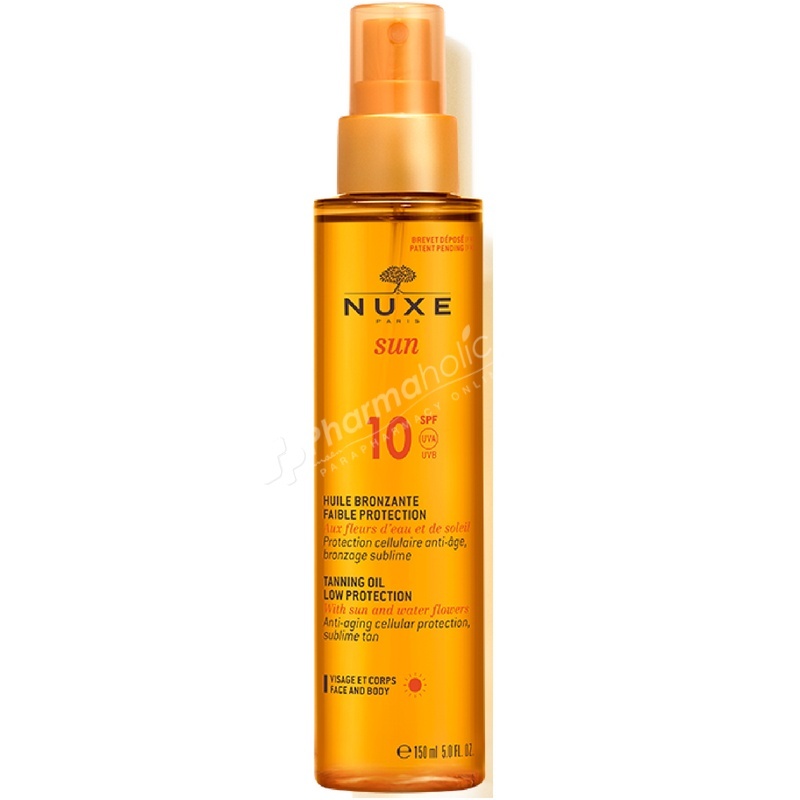 Nuxe Sun Tanning Oil SPF10 protects cells from ageing and helps you achieve a perfect tan. Its non-greasy feel and alcohol-free formula nourishes skin for a silky-smooth finish. A bewitching fragrance with notes of Sweet Orange, Tahitian Gardenia and Vanilla. This sun oil with Sun and Water Flowers protects cells from ageing and helps you achieve a perfect tan. Its non-greasy feel and alcohol-free formula nourishes skin for a silky-smooth finish. A bewitching fragrance with notes of Sweet Orange, Tahitian Gardenia and Vanilla. Tanning oil, it's the pleasure of tanning at its best. NUXE SUN Tanning Oil Face and Body SPF10 truly embodies NUXE SUN DNA: scientific expertise and unlimited glamour. Nourishing and non-greasy, this oil feels like the sun on your skin leaving it soft. The golden glints leave a satiny finish. Water-resistant. Photostable. Alcohol-free. Non-comedogenic. Without added preservatives.